Senior citizens have unique concerns and arguably one of the foremost among them is the ability to retain independence for as long as possible. Unfortunately, one of the most prevalent causes of the loss of independence has been increasing in recent years. The Centers for Disease Control and Prevention (CDC) recently released data indicating that falls are the leading cause of injuries and deaths among Americans ages 65 and older. In 2014 alone, there were 29 million reported falls and an average of 27,000 elder citizens die from falls each year. The statistics are equivalent to one fall among a senior for every second of every day. “Older adult falls are increasing and, sadly, often herald the end of independence. Healthcare providers can make fall prevention a routine part of care in their practice, and older adults can take steps to protect themselves,” said CDC Director Tom Frieden, M.D., M.P.H. The report from the CDC warns that it’s likely this problem will only continue to grow, since over 10,000 Americans are turning 65 every day. To combat this epidemic, the CDC has announced its creation of a new initiative: Stopping Elderly Accidents, Deaths, and Injuries (STEADI). This initiative consists of clinically driven protocols and resources for patients and families, as well as the healthcare providers who can help make fall prevention a routine conversation. STEADI recommends that all healthcare providers follow certain steps at each visit with a senior patient. 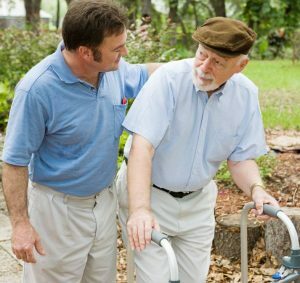 These include asking questions about the patient’s history of falls or concerns about unsteadiness, reviewing medications, and recommending ways of decreasing the loss of bone mass. Of course, it’s essential to take all necessary precautions to prevent falls in the home, but a fall could occur anywhere. If a slip or trip and fall accident occurs outside the home, it’s possible that it was triggered by the negligence of the property owner or manager. For instance, a senior might slip on a puddle of liquid inside a restaurant that should have been mopped up. Falls can happen when carpeting is frayed, floorboards are coming loose, lighting is inadequate, or handrails are absent – just to name a few common hazards. If you or your loved one has fallen and you suspect it may be due to someone else’s negligence, it’s important to contact a personal injury law firm right away. Waiting too long to seek legal counsel may lead to the forfeiture of your right to file a personal injury lawsuit. Filing a claim against a negligent party is more than a way of demanding that the individual be held accountable for negligent actions. It may also result in the recovery of compensation for the injured plaintiff’s medical bills, ongoing care needs, and other damages. Ellis Law attorneys have been helping injured people move forward for more than 20 years. When you or a loved one has been injured as a result of someone else’s negligent or reckless actions, you can count on our Los Angeles law firm to demand justice on your behalf. Call us at 310-641-3335 and we’ll gladly set up a one-on-one consult for you, free of charge, to explain your right to legal recourse.